"The only free road, the Underground Railroad, is owned and managed by the Vigilant Committee," "A Plea for Captain John Brown," 1859. 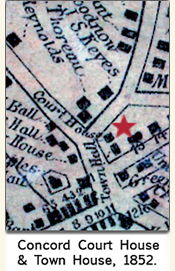 Explore the history of the Town House at Concord Free Public Library. Read The life, trial, and execution of Captain John Brown (1859). Learn more about Lewis Sheridan Leary, killed at Harpers Ferry, 1859. 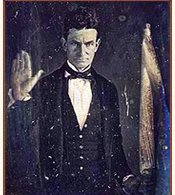 Learn more about the Secret Six, John Brown's Northern supporters, at the Massachusetts Historical Society. Browse Civil War maps at the Library of Congress. The Town House, which included the town hall, library, classrooms, and offices when it was built in 1851, provides particular insight into Thoreau's active involvement in community life in Concord. During the planning phase of its construction, the Building Committee paid him $4 to survey the property. Later, he complained that the Committee had set its sights far too low. 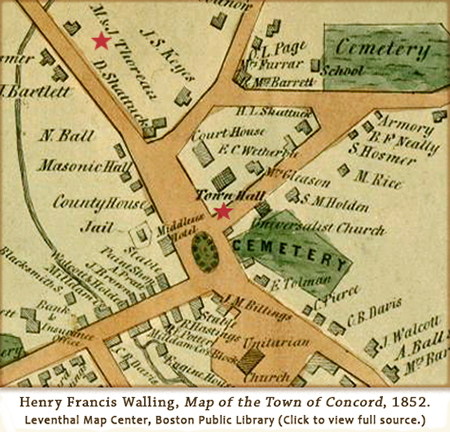 Had they been willing to spend additional funds to acquire books, paintings, and the like to edify the town's adult population, Concord could soon become, in his view, "the centre of civilization in the known world." Although the Town House never rose to Thoreau's expectations, it evolved into a major center of militant abolitionism as the anti-slavery movement became more overtly political in the run-up to the Civil War. In February 1857 and May 1859, for example, Thoreau joined the large audiences who heard John Brown speak here when he toured the Northeast raising funds for his clandestine anti-slavery army. In October 1859, Brown's failed attempt to foment a slave rebellion in Harpers Ferry sparked a national uproar. Having been deeply impressed by Brown's resolve to end slavery by any means necessary, Thoreau responded to the news by announcing almost immediately that he intended to express his support in a public forum. 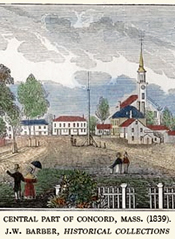 However, perhaps because the Concord Abolitionist Committee thought it too soon to speak out while Brown was still awaiting sentencing in a Virginia prison, he delivered his oration "On the Character and Actions of John Brown" in the vestry of the First Parish Church rather than Town Hall. Thoreau's fervent defense of the violent raid on Harpers Ferry, which he repeated in Boston and Worcester in early November, stood out as one of the first efforts to portray Brown, not as a madman, as both pro-slavery and anti-slavery newspapers initially alleged, but as an audacious savior whose name would become synonymous with freedom. The widespread coverage of these speeches, along with commentary by local notables such as Bronson Alcott and Ralph Waldo Emerson, has given rise over time to the impression that Thoreau had almost single-handedly transformed the abolitionist view of Brown from condemnation to glory. Within a week of the raid, however, abolitionists from around the country recognized Brown as a hero. Many continued to distance themselves from his methods, but the events at Harper's Ferry confirmed their increasing conviction that barbarity of slavery had eaten so deeply into the fabric of the country that bloodshed would be required to achieve its end. On December 2, 1859, the date of Brown's execution, services were held in cities and towns across New England, including Concord, where Thoreau, Emerson, and others spoke at Town Hall. In its December 5 account of "The Brown Excitement," the Boston Post reported that an effigy of Brown had been strung up in the tree in front of the Town House early the following morning. According to the Post, a note containing "The Last Will and Testament of Old John Brown" had been pinned to the effigy, which bequeathed to "H.D. Thoreau, Esq., my body and soul, he having eulogized my character and actions at Harper's Ferry above the Saints in Heaven." The Post also reported that the Concord radicals had voted to raise the American flag upside down, but were deterred by conservatives who threatened to respond with "a 100-gun salute in support of the Union." This may have been an empty threat, but it brings up political divisions that were reversed in the course of the Civil War. Long before cannons were heard at Fort Sumter, there was talk of disunion, not among proponents of slavery, who enjoyed the full support of the federal government, but among prominent abolitionists such as Thomas Wentworth Higginson and William Lloyd Garrison. From his arrest in 1846 for his refusal to pay taxes until his death in 1862, Thoreau never strayed from the Garrisonian motto, "No Union with Slaveholders!" In contrast with Garrisonian pacifists, however, he stood with disunionists such as Higginson and others who held that the violence inherent in slavery justified violent action against it. Thus, in "Slavery in Massachusetts" (1854), he declared in reaction to the rendition of fugitive slave Anthony Burns, "My thoughts are murder to the State, and involuntarily go plotting against her." The Town Hall provided the platform for the expression of similarly militant sentiments when the people of Concord gathered on April 4, 1860 to celebrate Franklin Sanborn's safe return from Boston, where he had been forced to appear in court after narrowly escaping arrest by federal marshals. 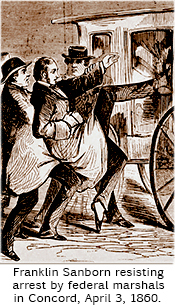 They had the night before attempted to take him into custody for his failure to answer a summons to testify about his involvement in the raid at Harpers Ferry, but his neighbors ran to his aid to prevent his capture. 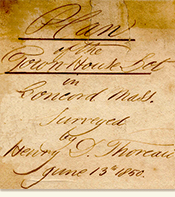 The next day, after a Boston judge ruled that the marshals had overreached their powers in Massachusetts, a crowd assembled at Town Hall to exalt in their successful resistance to federal government, a confrontation that Thoreau described as "the hottest fire he ever witnessed in Concord." "That the absurdity of professing to hold an anti-slavery interpretation of the Constitution while supporting by vote and every way the election of Abraham Lincoln...shows the masses of the party to be as unfortunate in their mental perceptions, as their leaders are in moral integrity and honesty." This resolution, which was accompanied by others that were equally incendiary, was passed immediately after remarks by Thoreau and Bronson Alcott, which suggests that neither hesitated to promote the most radical position of the moment, which, in the aftermath of Harpers Ferry, was that every law, every government, and every military force that served to perpetuate slavery must be resisted with violence if required. What was, however, most remarkable about this particular meeting was that the featured speaker at both the afternoon and evening sessions was H. Ford Douglas. A fugitive slave from Illinois, Douglas gained widespread acclaim as a brilliant orator, along with condemnation from both pro-slavery and anti-slavery factions, as he called for recognition of racial equality in all spheres of life. Douglas's remarks at Town Hall, like the dozens of lectures he delivered at anti-slavery meetings across New England, were apparently not recorded (or, perhaps, have yet to be unearthed from some neglected archive). However, the transcript printed in the Liberator of a speech he gave two weeks earlier at the July 4th meeting of the Massachusetts Anti-Slavery Society in Framingham provides some idea of what he might have said in Concord. "I am," Douglas proclaimed from the same platform where Thoreau had delivered "Slavery in Massachusetts,"
"a colored man; I am an American citizen, and I think that I am entitled to exercise the elective franchise...No party, it seems to me, is entitled to the sympathy of anti-slavery men unless that party is willing to extend to the black man all of the rights of a citizen." Since we have yet to locate relevant records, we may still learn more about Douglas's address in Concord, which stands out not only because he was one of the few African-Americans who were invited to speak at anti-slavery meetings in New England, but also because he was one of the few abolitionists who went beyond emancipation to demand equal political rights. In the meantime, we can surmise something about the impact of his words on at least some of his listeners from Sanborn, who may have arranged for Douglas to speak in Concord after hearing him in Framingham. There, taking the stage after Douglas, Sanborn illustrated the distance between Lincoln's commitment to saving the Union and the radical abolitionist view of the Constitution as, in Garrison's words, "a covenant with Death:"
"When I reflect...that Mr. Douglas, with every power, with every talent, which, had he been born of our race, would have secured him a prominent place, not only among the citizens, but among the rulers of this country, and remember that instead, in this, in his adopted state--a state which he earned by his heroic escape from slavery--he has not a single political right...It seems to me that our whole nation, our whole system of society, is not worth a straw." 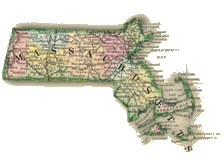 View the full map at the Harvard Map Library. Explore Thoreau's surveys at Concord Free Public Library. Read "Commemorating Concord," an examination of the making of the town's historical image, by Robert A. Gross. Read Disunion, Address of the American Anti-Slavery Society (1845). Read Sanborn's account of his near arrest in Recollections of Seventy Years (Boston: 1909). 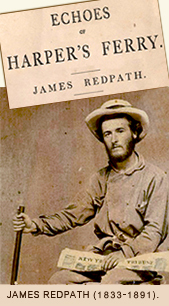 Read Echoes of Harper's Ferry, edited by James Redpath, a tribute to John Brown with contributions by H.D. Thoreau, R.W. Emerson, L.M. Child, L.M. Alcott and many others (Boston: 1860). Read John Brown, by W.E.B. DuBois (Philadelphia: 1909). To learn more about H. Ford Douglas's critique of Lincoln's ambivalent abolitionism, read Matthew Norman, "The Other Lincoln-Douglas Debate: The Race Issue in a Comparative Context," Journal of the Abraham Lincoln Association, Winter 2010.